What is SARFAESI Act 2002? 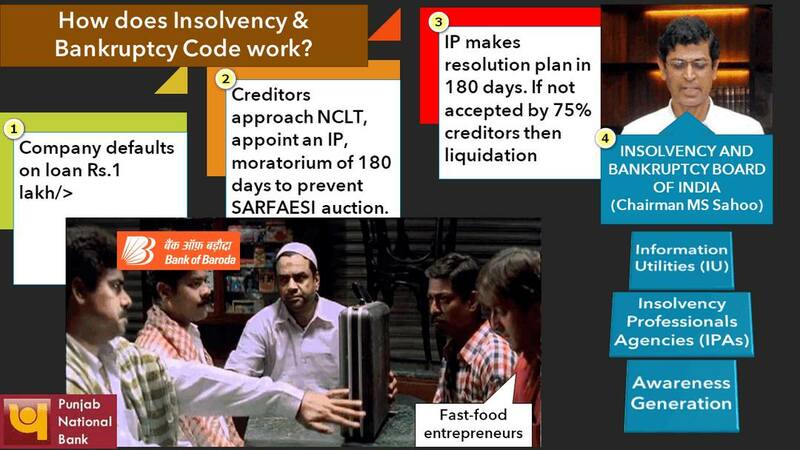 Why insolvency and bankruptcy code 2016? What is letter of undertaking (LoU)? How did PNB scam happen? If there is DICGCI, then why FRDI bill? What is Bail-In and Bail-Out? Why “Bail-in” fear is wrong? 2007-08: after the global financial crisis, UPA government’s policy paralysis & judicial activism there were bottlenecks in economic activities. Companies had difficulty in repaying the loans. By 2013: nearly 1/3rd of the bank loans were owned by IC1 companies i.e. companies not generating enough revenue even to repay the loan interest. For the farm loans, NPA is not counted on number of days but rather on number of cropping seasons. Total NPA among the scheduled commercial banks (SCB) is Rs. 8.40 lakh crores, majority of this is concentrated in the public sector banks (PSBs), as of 31/12/2018. Loss Asset When Bank, its auditor or RBI says that given doubtful asset has little / no salvageable value. When loan is written off from the ‘asset-side’ of the bank balancesheet, to save corporation tax. Loan write-off doesn’t waive bank’s right to recover it, it’s merely an accounting exercise for tax-benefit. Restructured loan When principal / interest rate / tenure of the loan is modified. Ever-greening Taking a new loan to pay off the old loan. In this mechanism, Bank doesn’t change in loan interest, tenure or terms, but asks client to rectify his loan-repayment irregularity. In genuine case, additional loan may be given to help the client revive the business or bank tries to find a new partner / investor for the project. Additionally, RBI ordered the Banks to do AQR: Asset Quality Review. (2015, Oct). Banks and NBFCs have to report large loans (Above 5 crores) to RBI’s Central Repository of Information on Large Credits (CRILC). Initially, they had to report on monthly basis, now they’ve to report on weekly basis. Restructuring (2014-16) Loan interest (%), tenure or ownership could be changed. 5/25 for Infra loans: RBI allowed Banks to extend loan tenure to 25 years, and even reduce loan interest rate for the client. But, such Interest rate will be reviewed each 5 years. SDR- “Strategic Debt Restructuring”: Bank’s Debt (Loan) is converted to Equity (Shares) & bank sells those shares to highest bidder. This will lead to change in ownership of company. S4A- Scheme for Sustainable Structuring of Stressed Assets: only unsustainable portion of loan converted to equity (Preferential Shares) & sold off to investors, in such manner that it’ll not change the ownership of company. JLF (Joint lenders forum): consortium of the lenders, who will work out above restructuring, on the basis of majority voting. Although this model proved unsuccessful because public sector bank officials would not vote positively due to the fear of Media +4C [court, CBI, CAG and CVC]. RBI has stopped these schemes from 31 March 2018. Now banks can restructure loans only under the provisions of insolvency and bankruptcy code 2016. Insolvency And Bankruptcy Code 2016 [if 75% of the creditors don’t agree for restructuring / resolution plan, then assets will be liquidated]. 1993: debt recovery tribunals (DRT) were set up, so ordinary courts can’t interfere in the loan recovery process. 1998– Narsimhan-II Committee observed that DRT need to be strengthened with a law. 2002: Securitization and Reconstruction of Financial Assets and Enforcement of Security Interest (SARFAESI) Act was enacted. Under this act, banks and housing finance companies (NBFCs) can attach the mortgaged assets when loan is not repaid. They can auction / sale / change board of directors in such assets / companies. They can also sell such assets to asset reconstruction companies (ARC). These provisions are not applicable on the farm loans though. If client wants to obtain a stay order, he cannot go to ordinary courts. He will have to approach for debt recovery tribunal (DRT), with application fees ranging from 12,000 to 1.5 lakh depending on the loan amount. DRTs are understaffed, over 1 lakh cases are pending (2016), and Rs.1.5 lakh is a small fee for large corporates. So, case will go on for years and the debtor will remain in possession of the asset. If DRT doesn’t give stay order, then client can appeal to debt recovery appellate tribunal (DRAT), but DRAT will require him to deposit minimum 50% of the loan dues. Because, SARFAESI-DRT understaffed so recovery is time-consuming, Debtor remains in possession, which leads to erosion of asset-value (machinery, vehicles) even when DRT allows auction. In some businesses, auction or liquidation may not yield the best return for the banks (e.g. hotel resort in remote area, where no other buyers are keen to spend high amount). Instead if the loans were restructured, banks could salvage more value. But, SARFAESI act doesn’t permit that. Once case goes in the SARFAESI-DRT, there is no scope for arbitration (मांडवाल मुश्किल हो जाती है). This is same like, IF Sanjay Dutt was arrested for murdering Fracture Pandya’s brother, the court will only hear case under IPC- whether it was a murder in self-defense or not? But what if both parties went to an arbitrator Suleman Bhai, where Sanjay Dutt would pay blood-money to Fracture Pandya, and all will be forgotten and forgiven? I&B code works on similar principle. Company defaults on a loan of ₹ 1 lakh or more. Creditors approach national company law tribunal (NCLT), to initiate proceedings under the insolvency and bankruptcy code. NCLT will grant moratorium of 180 days (so that no other creditor can unilaterialy attach assets under SARFAESI Act). Within that 180 days, an insolvency professional (IP) will make a resolution plan e.g. client should repay only 8 lakhs instead of 10 lakh, loan interest reduced from 18% to 12%, loan tenure extended from 10 years to 12 years or IP could even find another investor to finance the pending project et cetera. If 75% of the creditors agree with above resolution plan, then it will be set in motion, otherwise, IP will liquidate the assets of client and recover the dues. Client (individual / partnership firm) can appeal against above at the debt recovery tribunals of the SARFAESI Act. Client (companies) can appeal against above at the NCLT of the companies Act. It is the statutory body that monitors and implements I&B Code. IBBI composition: one chairman (M.S.Sahoo), 1 nominated member from RBI, other members from Government’s side. Total 1 chairman + 9 member = 10 people. IBBI’s administrative control rests with the Ministry of corporate affairs (MCA). Minister of corporate affairs administers the oath of IBBI chairman. Chairman has 5 years / 65 age tenure, whichever earlier. He is also eligible for a reappointment. If IBBI itself launched a database portal to moniter all loans, it’ll be expensive. So, IBBI delegates this work to information utility (IU). In 2017, NeSL: national e-governance services Ltd (owned by consortium of SBI, LIC etc.) was the first to get the IU status. It is compulsory for the lenders to share data with IU. by looking @client’s borrowing history, lenders can make informed decisions about whether to give loan or not and how much interest to charge? This database also helps establishing documentary proofs during NCLT / DRT / liquidation- claim proceedings. (MCQ- Yearbook) Which of the following statutory bodies fall under the Administrative control of Ministry of Corporate Affairs? Ans. both fall under MCA. willful defaulters: A borrower who has the capacity to repay, but he’s not repaying the loan. I&B can begin against a company only AFTER the bank / NBFC file a motion at NCLT. PSBs were reluctant/hesitant to even file motion @NCLT. Resolution plan बनवाना तो दूर की बात है. Resolution plan can work only if 75% creditors approved. But even in such joint lenders’ forum, PSB-executives will shy away from voting positively. To solve this, government drafted banking regulation Ordinance (2017-May). RBI can force the bank file motion @NCLT to begin proceedings under I&B code. Voting process tweaked so minority bank-lenders can’t disrupt things. They’ll be bound by the majority decision. Thanks to I&B code, Banks are able to recover more amount, than If the same company’s assets were auctioned off under SARFAESI act. Thanks to Banking ordinance, RBI forced the PSBs to refer ~3 lakh crore worth cases to NCLT for I&B resolution. If he borrows from PNB (India), then he has to bear A) higher interest rates (~12%) B) additional cost of converting rupees into dollars. But, if he borrows from a bank in Hongkong, then A) lower interest rate (5%) B) those banks directly give loans in US dollars. But, the Hongkong Banker may not give such loan to Nirav, because he doesn’t know NIRAV’s history. So, Nirav will have to bring a character certificate / guarentator. Question: Why would PNB act as ‘big brother’ for Nirav? Ans. Because PNB will charge fees for generating such LoU. PNB could also ask Nirav to deposit some collateral money / diamonds to ensure that even if Nirav flees away, PNB will not make a substantial loss. Upon receiving such LoU, the Hongkong bank will create a NOSTRO account for PNB, and deposit loan money in it. 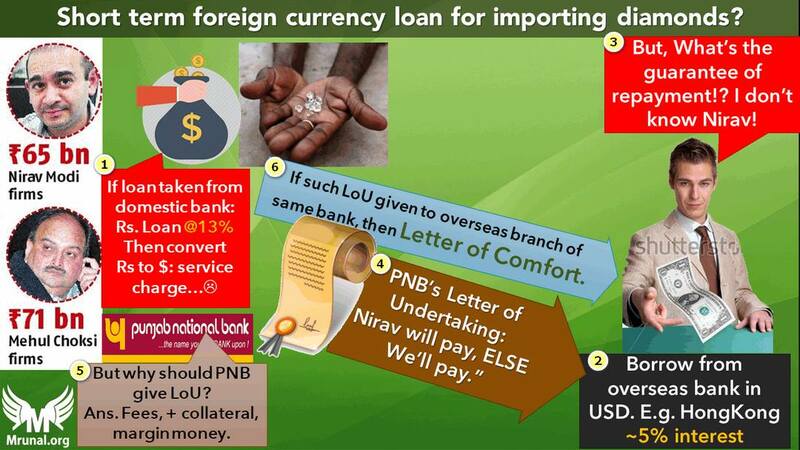 From there, PNB will grant authorization to Nirav to use the money for diamond imports. Corrupt PNB officer “Shetty” generated LoUs for diamond merchants without taking collaterals. PNB officer Shetty even shared the username/password of PNB’s SWIFT messaging system, so diamond merchants could generate LoUs as and when they pleased. New LoUs were generated to repay old LoUs. PNB’s SWIFT messaging system was not integrated with PNB’s core banking solution (CBS) portal, so other officials couldn’t sniff this. Scam ran for 7 years, worth nearly 12,000 crores. PS: Scam’s Modus Operandi not important for MCQs or descriptive questions. SFMS was designed by Tata Consultancy Services (TCS) designed for IDRBT (Research arm of RBI). SWIFT was designed by Society for worldwide Interbank financial telecommunication. It’s a Cooperative in Belgium’s La Hulpe city. SFMS Works as backbone of NEFT, RTGS, and other inter-bank, intra-bank e-transactions modules within India. SWIFT is a GLOBAL Messaging module for communication among banks, NBFC and brokers. It’s useful for entities not having direct bank relations / settlement systems with each other. SBI to ICICI doesn’t need SWIFt, because they’ve settlement system of NEFT/RTGS run by RBI with SFMS. But what if ICICI wanted to remit money to Marshall Island? then SWIFT messaging is useful. यानि की भारत के अंदर ही पैसा का व्यवहार करना है तो SFMS चल जाएगा, लेकिन विदेशो में पैसो का व्यवहार करना है तो SWIFT इस्तेमाल करना मंगता है, क्योकि हरेक विदेशी सन्गठन ने SFMS install किया हो ऐसा जरूरी नही..
(Mock MCQ) Which of the following is not a financial messaging system? (Mock MCQ) Which of the following involves three parties? h/ Cheque has three parties: 1) drawer (maker) 2) drawee (bank) 3) payee (recipient.). Promissory note has only two parties: Drawer and payee. LoU has eight parties: 1) opener 2) issuing bank 3) advising bank 4) nominating bank 5) confirming bank .. anyways, such B.Com type MCQs not important for UPSC prelims. 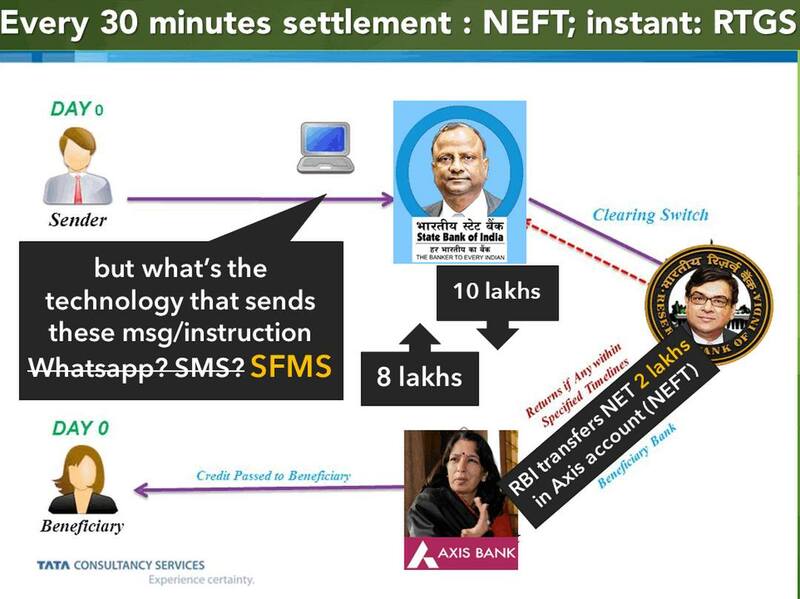 RBI ordered all banks to integrate their swift messaging system with their CBS system. If RBI maintain a loan-database, then it will reduce the information asymmetry between the borrower and the lender i.e. lenders could know the full history of borrower, his assets and past track record. Accordingly, lender can decide whether to pass his loan application or charge higher interest? RBI can use such loan database and its big-data analytics to check the efficacy of its monetary policy and tweak repo rate etc. accordingly. To set up such public credit registry (PCR), RBI constituted Yeshwant M. Deosthalee Committee (August 2017 to April 2018). But why do we need PCR? Isn’t existing mechanism sufficient? RBI has given license to four CICs- CIBIL, Equifax, Experian, CRIF Highmark- Under the Credit Information Companies Regulation Act (CICRA 2005). RBI has its own “Central Repository of Information on Large Credits (CRILC)” for Loans above Rs 5 cr. Lenders have to submit weekly updates. Insolvency and bankruptcy board of India (IBBI) has authorized the National e-governance services Ltd (NeSL) to act as an information utility (IU). Not all of these databases are under the direct control of RBI. Not all of these databases are covering both individual and corporate borrowers. None of these database covers each and every borrower of India. If RBI sets up its own PCR registry, it can solve above three problems. (Mock MCQ) What is the objective behind creating a “Public credit registry” in India? Dept of Financial Services to have data related to PM-Jandhan overdrafts & farm loans. SC directive so that ordinary citizens can know which corporate has borrowed how much from the banks. RBI vision to remove information asymmetry between lender and borrower. if a company is blacklisted by Indian banks, it could apply for loans overseas, and those foreign bankers may not be aware of company’s history. So, there should be a global “Aadhar card” number for companies, and they must be forced to quote that number during every financial transaction. This is the concept behind legal entity identifier (LEI). It is a 20 digit alphanumeric code for the companies. After sub-prime crisis and global financial crisis (GFC), G20 and Financial Stability Board (FSB) came up with this idea of LEI. LEI’s Indian agent: clearing Corporation of India. Companies who have taken loans above Rs.1,000 crore from India banks have to obtain this number by 31/8/2018, then gradually smaller companies have to obtain LEI-number in a phase-wise manner. Companies have to quote this number in derivative market as well. (with caveats, not important for UPSC). (Mock Question) Which of the following organization has mandated Indian corporates to obtain Legal Entity Identifier (LEI)? Insurance company itself fails to honor its financial obligations towards the policy-holders? Policy holders can complaint to Insurance Ombudsman. Insurance companies are required to buy re-insurance on their own business. So, such re-insurance company (like GIC-Re, Munich-Re) will also help indirectly. What if a company fails to honor its financial obligations? Investors can approach SEBI and national company law tribunal (NCLT). If company is a willful defaulter OR has zero capacity to repay, then banks can liquidate its mortgaged assets under the SARFAESI act. If company is not a willful defaulter, and has capacity to repay some of the loan, then Bank can try to work out a resolution plan under the insolvency and bankruptcy code 2016. Bank itself fails to honor its financial obligations towards the depositors? For ordinary and individual complaints, depositors can complaint to banking ombudsman (of RBI). If the bank shuts down, DICGCI can pay upto Rs.1 lakh to individual depositor. It means the banks have to pay insurance premium to the DICGCI. DICGCI is 100% owned by the RBI. One of RBI Deputy Governor acts as chairman of DICGCI. Its HQ is in Mumbai. 2002: UTI (a Government owned mutual fund company) made big losses. DICGCI not liable to protect its depositors. So, Government had to give Rs. 14,561 crores bailout package. 2001: Share broker Ketan Parek swindled Madhavpura cooperative banks’ Rs.1,200 crores. DICGCI paid only Rs.464 crores to depositors. [Because its maximum guarantee is Rs. One lakh per customers]. To recover the remaining amount, Central Registrar of cooperatives (under Agri. Ministry) appointed a “liquidator” under Multi-State cooperative societies Act. But, Ketan Parek obtained SC stay order till 2017. So, 1200 – 464 = 736 crore of bank depositors’ money still stuck. Means, the present DICGCI model is insufficient to protect even bank-depositors. 2011-13: Financial Sector Legislative Reform Commission (FSLRC) under Justice BN Sri Krishna. He observed that it’s neither feasible nor desirable to have 100% failure prevention of financial intermediaries (FI = banks and non-banks). If an FI fails, that’s also a good thing because its labour and capital can be shifted to more efficient firms. But we must resolve this swiftly, else investors, depositors and citizens at large will suffer. Therefore, we should convert DICGCI into a resolution corporation (RC) for both banks and non-banking financial intermediaries, through a law- just like the advanced economies (AE) of the world. 2017, August: Government drafted Financial Resolution and Deposit Insurance (FRDI) Bill, 2017 to implement above suggestion. It transforms the DICGCI into a Resolution Corporation (RC). All financial intermediaries (banks and NBFCs) will have to buy insurance from RC, to protect their depositors. RC will monitor and classify these banks and NBFCs into following risk categories: Low, Moderate, Material, Imminent, Critical. When a bank / NBFC comes in ‘imminent risk’, RC will draft a resolution plan before it reaches critical risk. Bridge institution If RC is unable to find a merger-worthy FI immediately, then RC will create a new company to look after the affairs of the sick-FI, until a suitable buyer is found. Liquidation In the worst case scenario. Bail in provisions In some scenarios. Crisis comes when right hand side of equation becomes weaker and it can’t balance the left hand side. PNB runs into huge NPAs vs. Depositor wants Rs.5 lakhs back. Resolution corporation will pay the depositor Rs.1 lakh. He still wants 5-1 = 4 lakhs back. If Government of India injected additional capital into PNB, and from that money, if Rs.4 lakhs were given to depositor = “BAIL-OUT” using tax payer’s money. BUT instead, what IF Resolution corporation takes following action? So, when depositors’ liability is restructured / reduced to save the financial intermediary… it is called “Bail-In”. Even under the Banking regulation act 1949, when RBI forces the merger of weak bank with strong bank, it could reduce liability of depositors when accounts are shifted to the new bank. So, Bail-in is not a new idea. Just like DICGCI, the new RC will be insuring Rs.1 lakh rupees for every depositor. (or more, if parliament increases the limit). If depositors feel injustice in Bail-in, they can file claim at National Company law tribunal (NCLT) for higher compensation. Public sector banks are not sacred cows. It’s not written in the FRDI bill that PSBs can’t be shutdown and liquidated. So, the fears that PNB’s losses will be offset using depositor’s money… is a baseless fear. RC will have to send report to Union government and the relevant financial regulator (RBI, SEBI etc) to justify why “Bail-in” provision was used in a particular case. 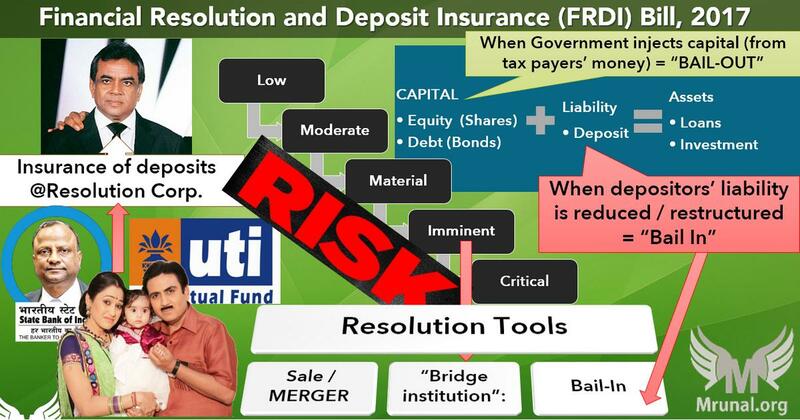 Bail-in is a “prospective” provision applicable on future deposits & investment. It can’t be applied “retrospectively” on past-deposits to pay-off the past scams like Nirav Modi and Vijay Mallaya. 2.11 lakh crore recapitalization package for BASEL-III, 1.35 lakh crore worth Bank recapitalization bonds, and EASE-Framework for reforming public sector banks. u are like father and mother to us :). who take cares of their child and spoon feeds him the needs. sir! are you not going to upload economy lectures this session? please let me know sir. मृणाल सर जी क्या इसबार आप वीडियो नहीं बनाओगे क्या. अगर आप वीडियो बनाओगे तो बड़ा फायदा होगा. कृपया हम बिहारी लोगो पे एहसान कर दीजियेगा. Thanks so much, Sir. You articles are as good as your videos, and that’s saying something since your videos are the best in the market. Thank you so much sir! for this valuable article…. Shukriya sir, Rabb thonu saariyan khushian bakshe. Thankyou sir. Appreciate your effort . Yes I think he intended to say 2017 instead of 2018. Sir i follow many websites for civils but i can confidently say that this is the best one , i have only one request please post atleast 2 articles in a week sir. 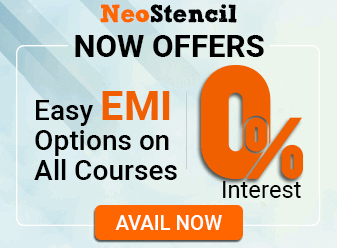 i want to see your website expand into other domains as well not just economics. Sir thanks for this efforts for us. But I’m unable to find videos of the same on YouTube. Is these only article / ppts or videos are being uploaded on any other YouTube channel. Thanks a lot sir helping from the very first day of my preparation. it’s depositors’ liability or bankers’ liability…….? Sir, I have a query regarding “bail-in” example given by you. You said that the depsitor initially had 5 lakhs with the Bank and during bail-in clause is invoked, only 3 lakhs were restructured as shares of that Bank. So, where does the remaining 2 lakhs of the depositor gone? Is it depositor’s liability or bank’s? I thought I understood this perfectly from the news (DIGCI esp.) But mrunal sir never fails to give a new perspective! Thank you so much sir.